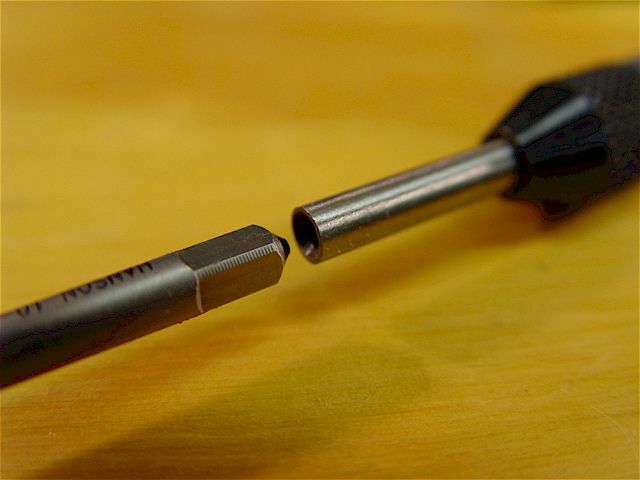 tap breakage that can easily occur when too much torque and/or side forces are applied. 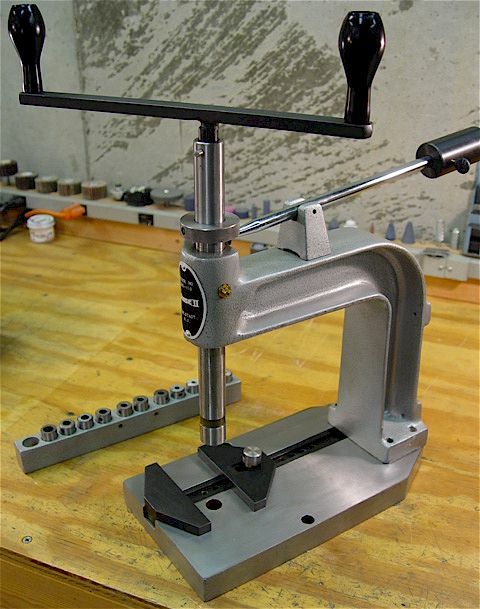 This hand tapper includes a set of adapters: #6, #8, #10, 1/4", 5/16", 3/8", 7/16", 1/2" & 5/8". 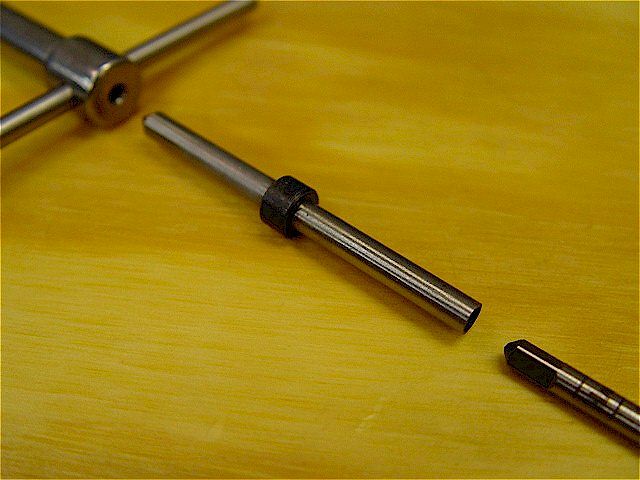 The tap is first fixed to the adapter & then snapped into the spindle. removed as it is held in by a tapered pin. 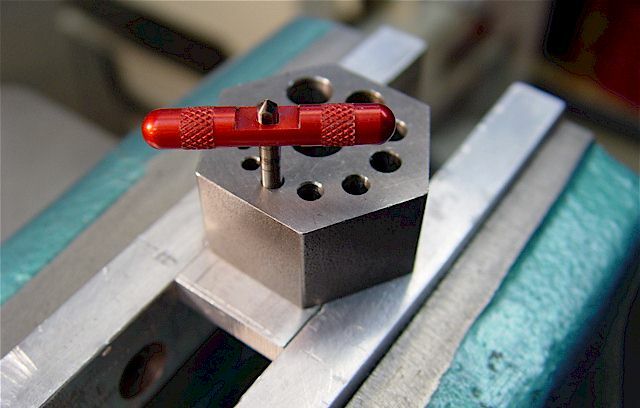 For small taps, the knurled finger knob is used. The adjustable counter-weight applies a slight upward force that aids unthreading the tap. first rotating the flat detent spring to release the ball bearing detent. Be careful to not lose the ball detent. Tap Capacity #6 to 5/8"
Detail of the spring-loaded ball bearing detent for adapter retention in the precision ground spindle. threads. 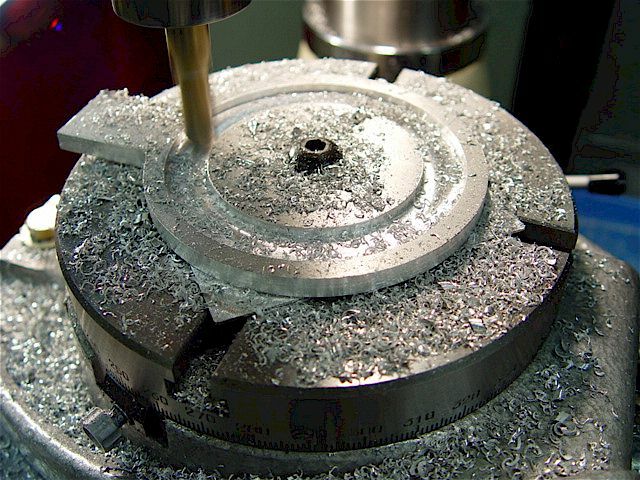 A rotary table was used to drill every 45 deg. 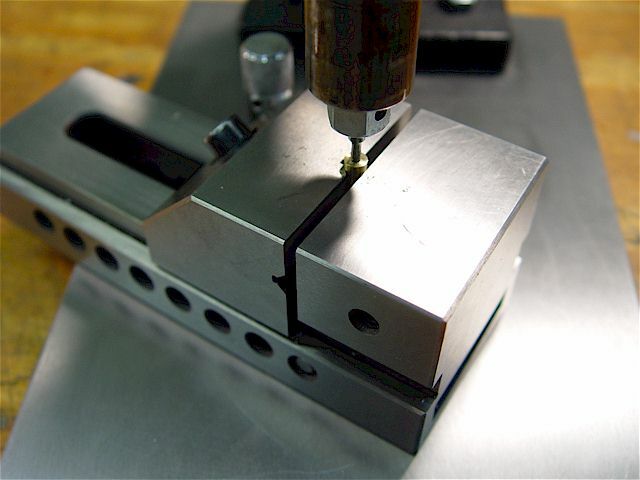 A semi-automatic machine tapper is faster. 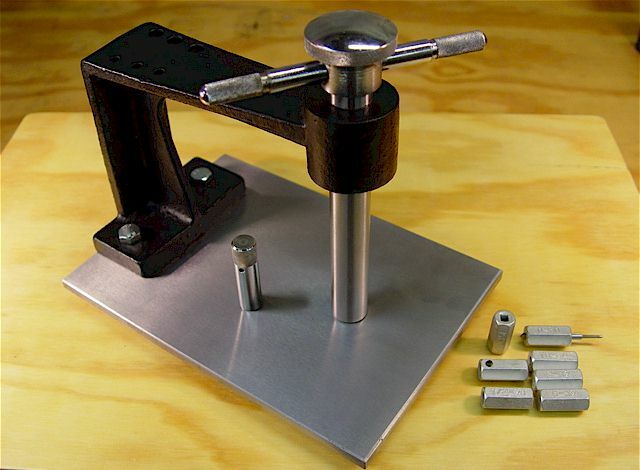 To steady the hand tapper, 5/16-18 SS bolts screw into bench hard points. 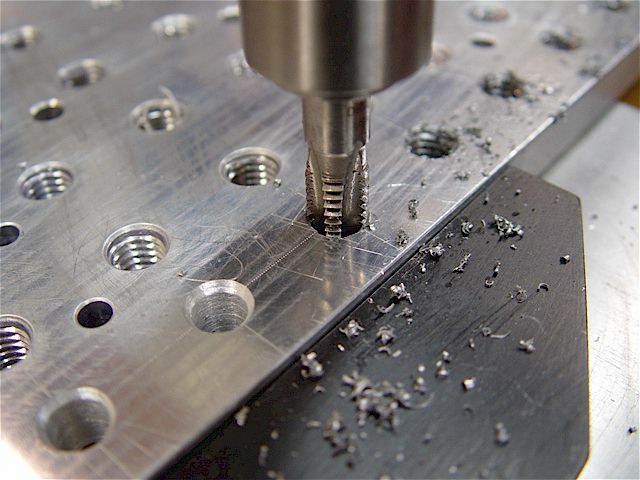 The 3/4" holes were drilled using a Forstner bit. The hard points are held in underneath by wood screws. I remove the tapper when not in use & screw the bolts up from the bottom until they are flush. 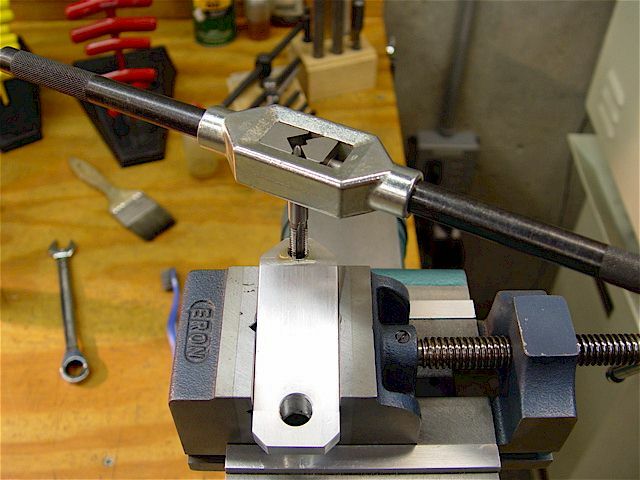 The bolt-down hole has also been 3/8-16 threaded to use the clamping studs, as needed. 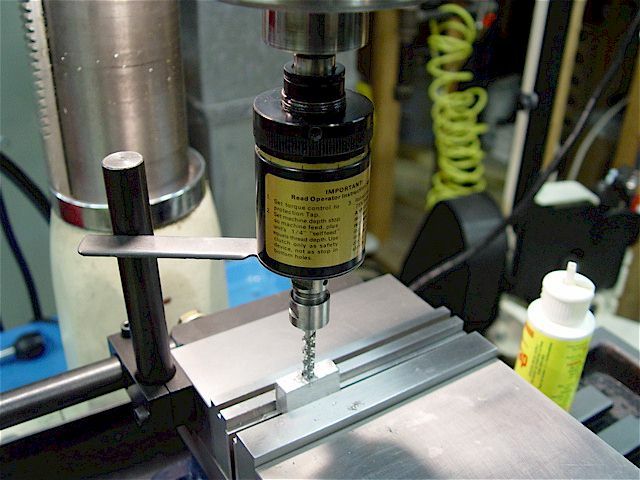 Always chamfer the hole first & use the proper thread-cutting fluid. 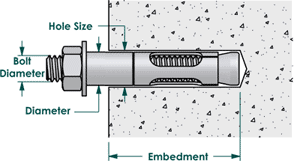 materials (steel, SS) use a larger tap hole for 50% threads to reduce tap breakage. See tap hole tables. cut more successfully than fine. 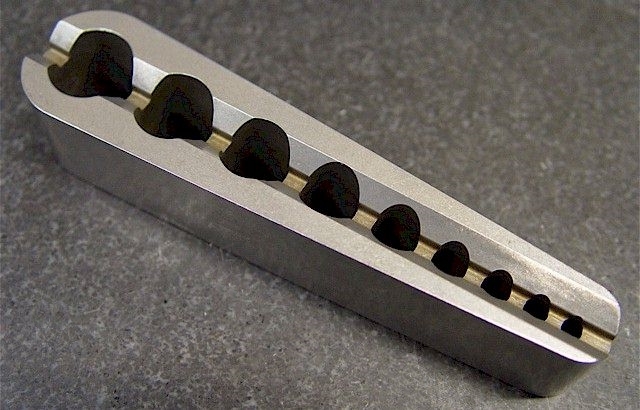 Softer steels can have higher percentage threads (in the 60s). 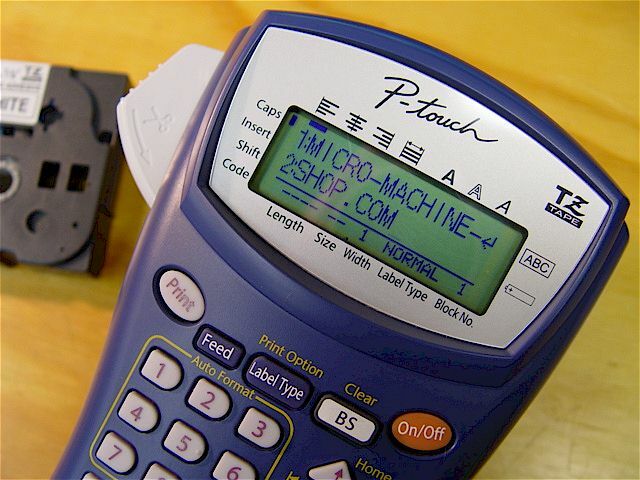 There are formulae for calculating any desired percentage threads or use the Machinist Calculator. 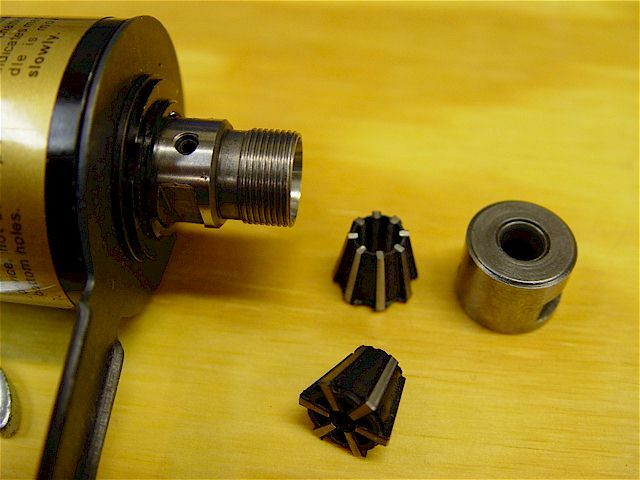 The set of hand tapper adapters: The leftmost is a custom made, aluminum adapter for a 1/8-27 NPT tap. 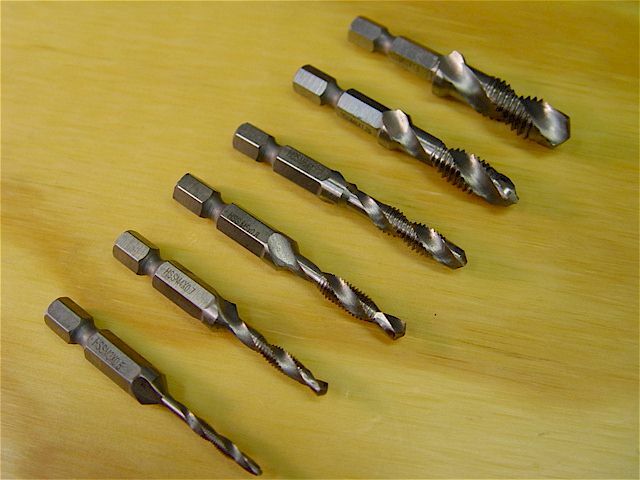 Then left to right are 5/8", 1/2", 3/8" (2), 7/16", 5/16" (2), 1/4", #10, #8, & #6 hardened steel tap adapters. 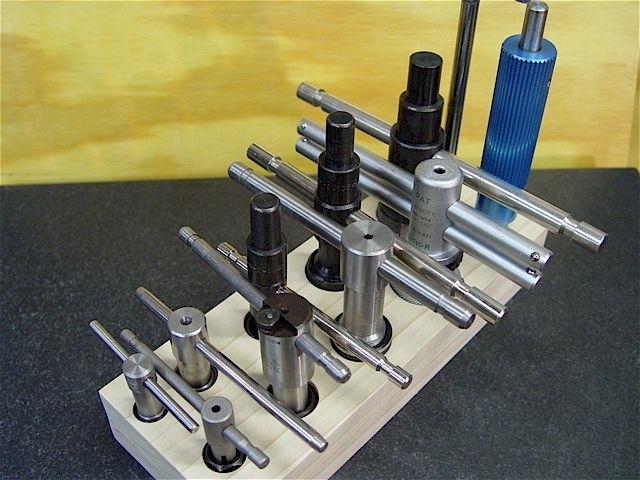 Wooden holders tend to draw moisture away from metal thus minimizing rust. 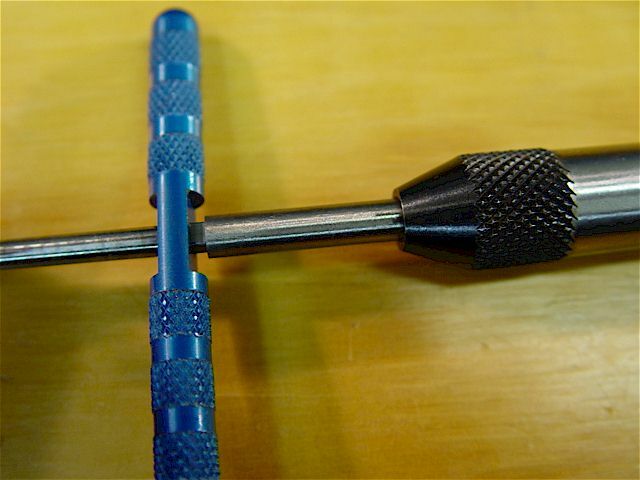 a square hole at the end that positively engages the tap in order to prevent rotation. Note the recess for the spring-loaded detent. A spiral-fluted bottoming tap is shown. Cedarberg (USA) hand tappers are the best & most costly models while the others are lower-cost copies. 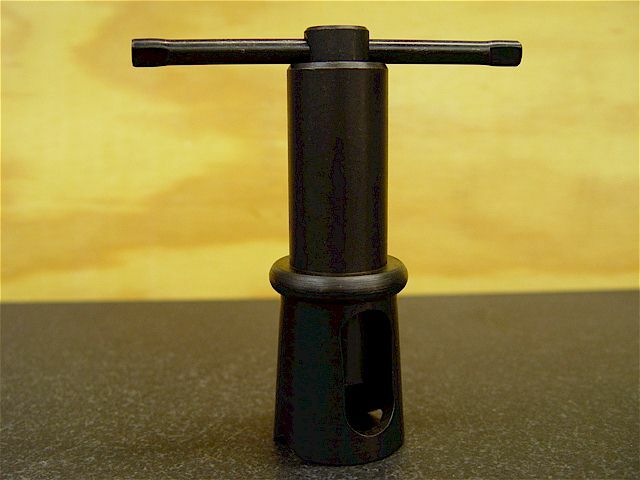 This is a small hand tapper with adapters for seven different tap sizes 0-80 through 5/16-18. 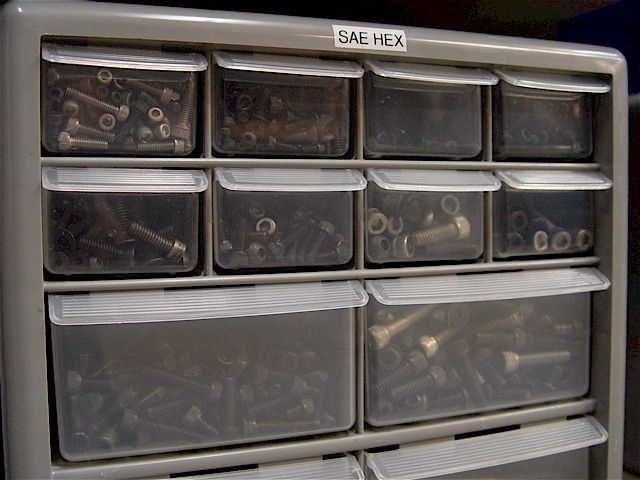 Each hex-shaped adapter has a square hole & a set screw to securely engage & hold the tap shank. 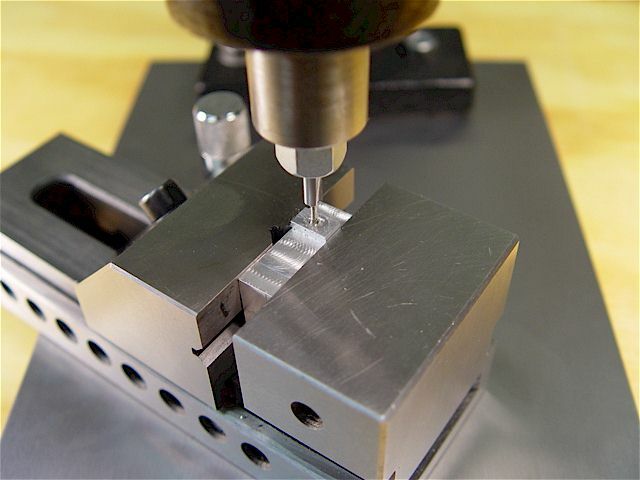 provide more table room for the vise/part. 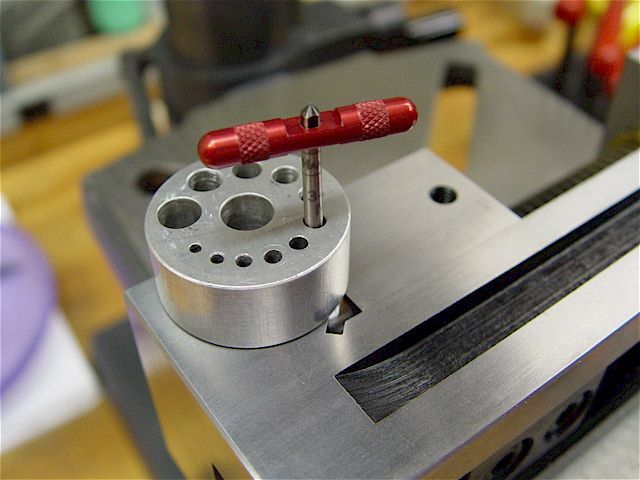 The pin's hole can also be used to bolt-down to a bench hard point. 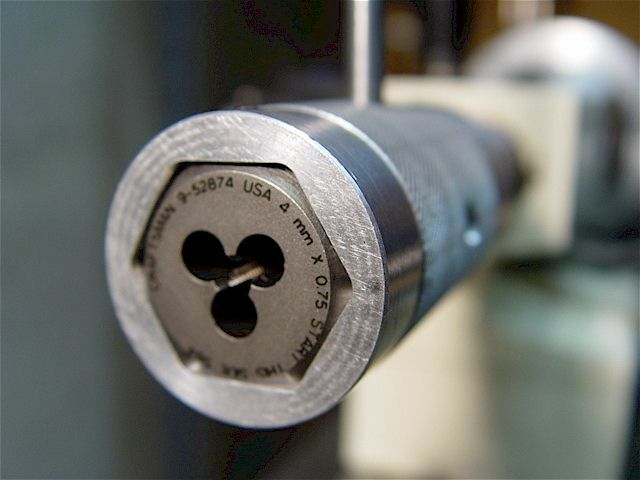 The finger knob is used with smaller taps to allow better feel & lower torque thus reducing chances of breakage. The steel table is 8.5" x 6", the clearance height is 3.75", the throat depth is 4.5", & the overall height is 9". 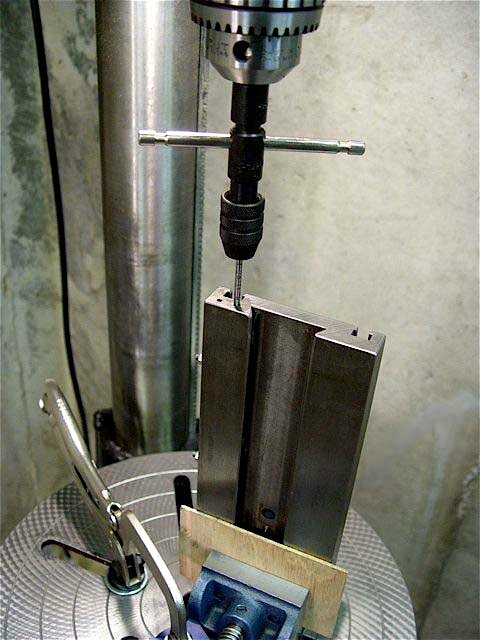 This example shows a 0-80 tapping operation where a 3/64" tap hole is required for a 75% thread. 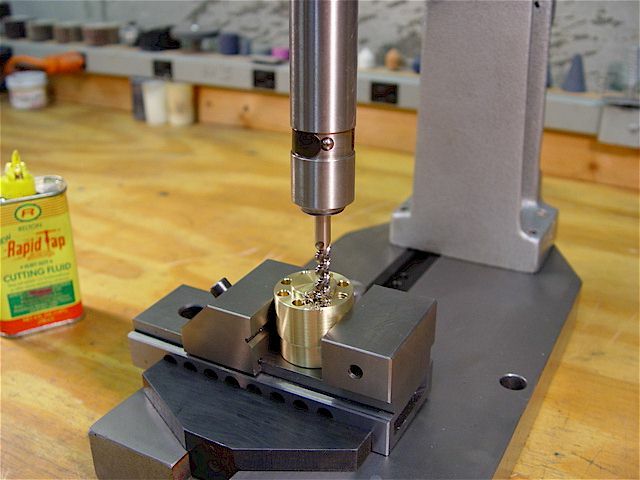 Tapping 6-32 threads into a brass weight. 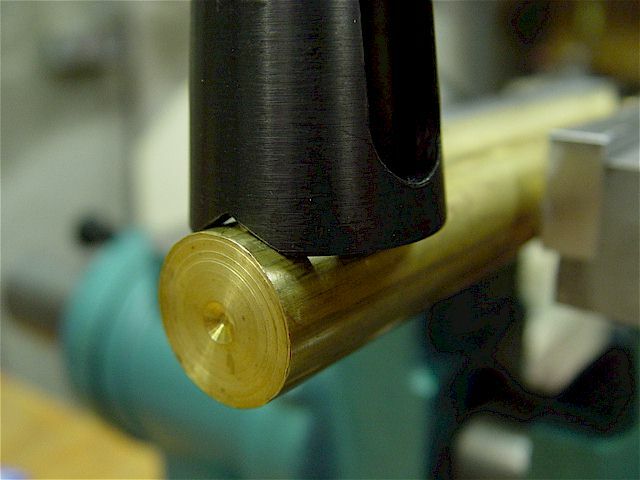 Tapping 2-56 threads into the end of a brass rod. Differently sized tap handles correspond to various tap-size ranges. Top: The two larger handles are Craftsman (USA). Middle: The one medium-sized handle is from Germany. 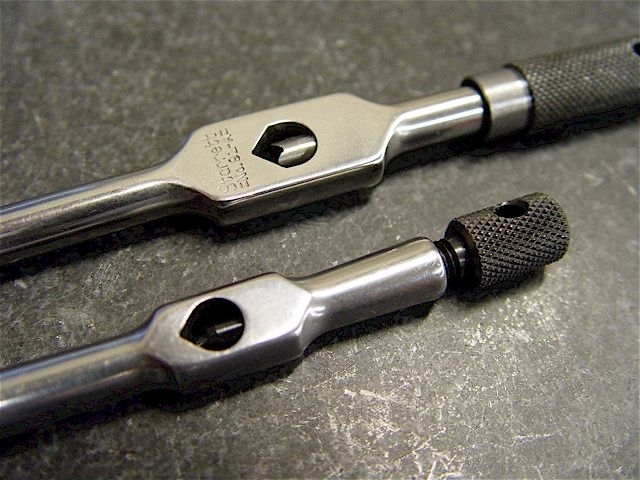 Bottom: The two smaller Starrett (USA) handles have superior design & quality. The Starrett tap handles have smooth, ideal shapes; best in class. 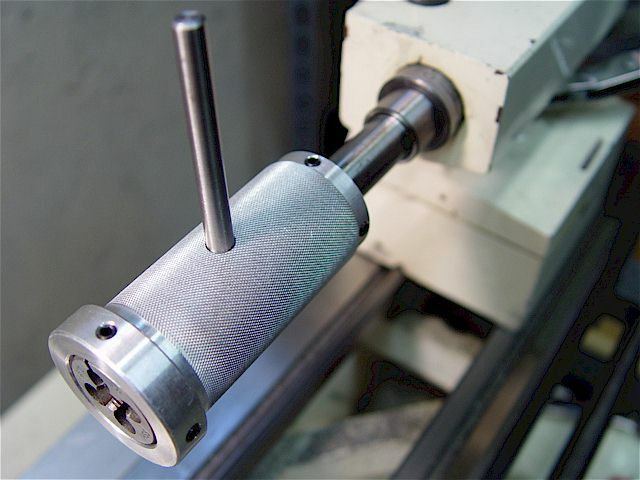 Large handle is being used to tap 75% 3/8-16 threads in aluminum. 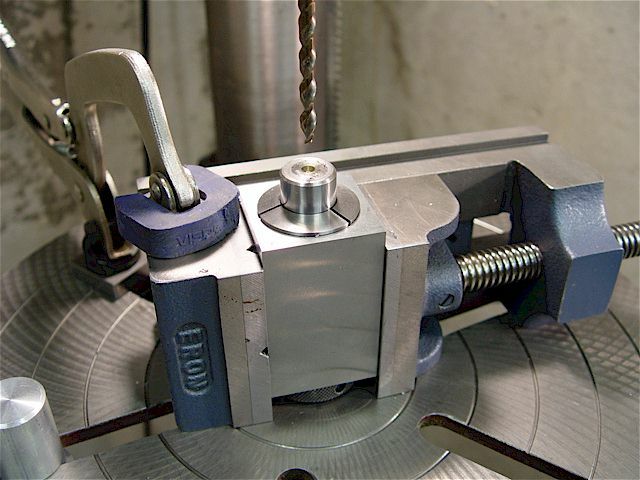 The smaller blue vise holds the part for transfer to different machining setups. Maximum chuck capacity is 0.502". 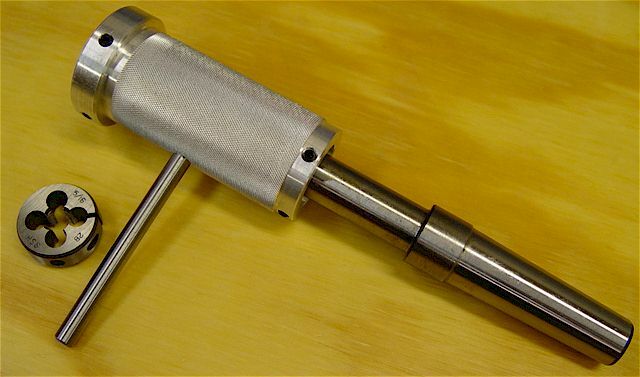 This larger tap handle holds up to the 1-1/16" H hand reamer. 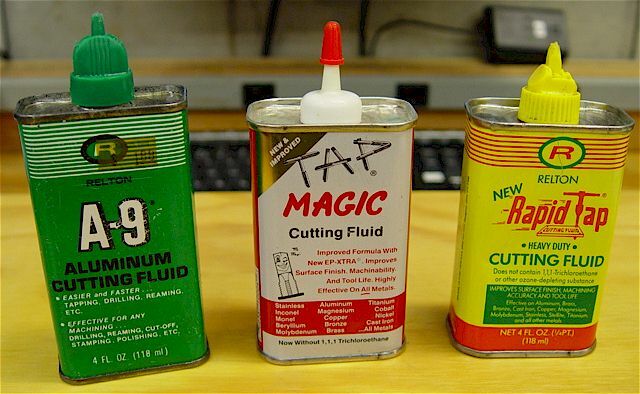 Always use the appropriate cutting fluid. Some fluids are specific (e.g., for aluminum) while others generic. Kerosene works very well for aluminum. 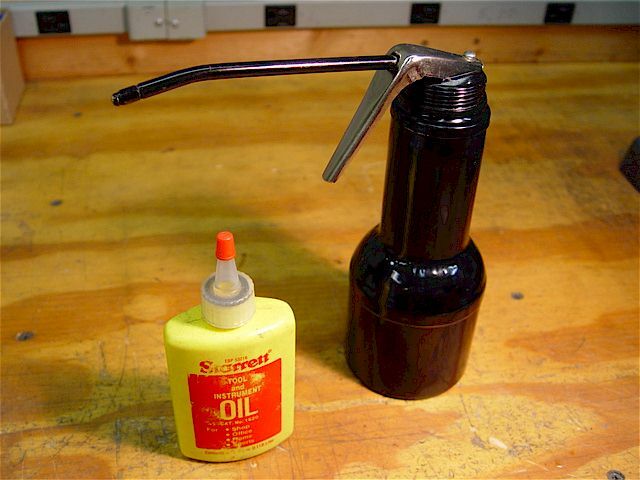 Use an acid brush to dab on small, controlled amounts of fluid. 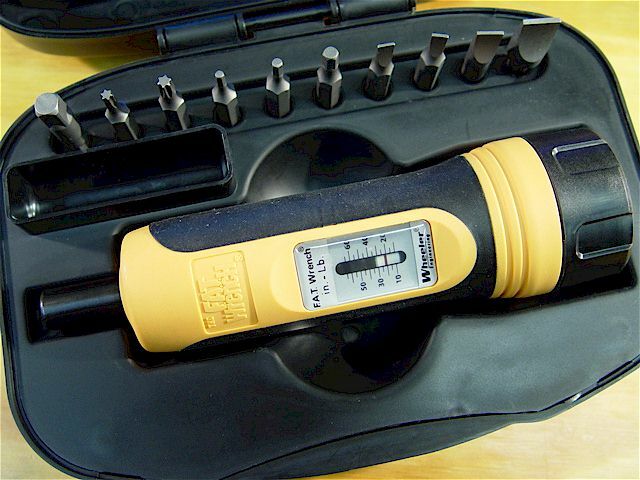 Cutting fluids have low flash points. Micro-tap handles for very small (#0 to #6 & M1.6 to M3.5) sizes. Affords good feel while cutting threads. 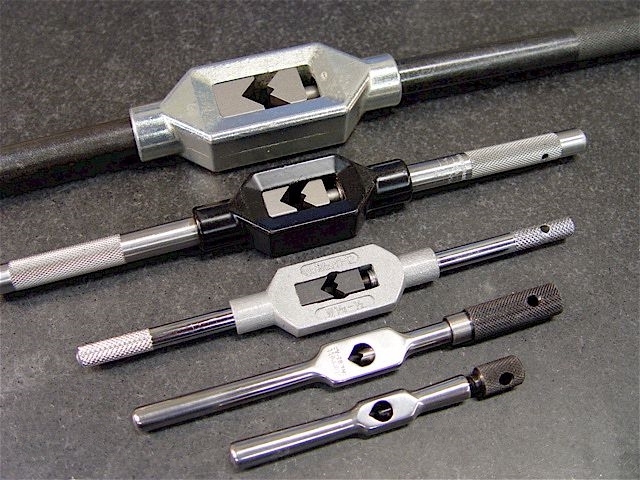 Tap wrenches of various sizes. 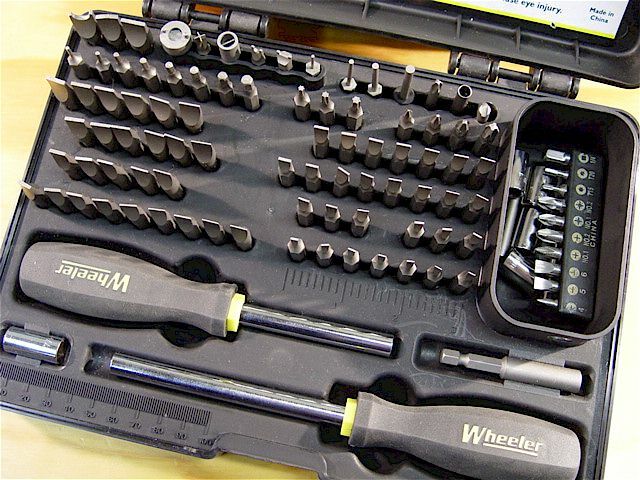 The two black wrenches (left) have integral guides that mount in a drill press, mill, or lathe chucks. 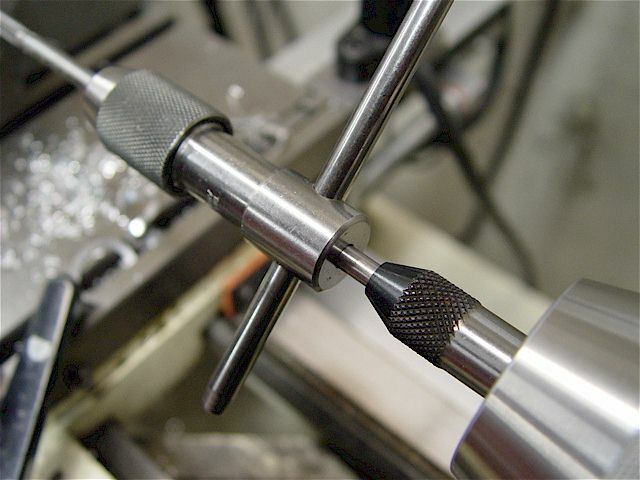 have a chamfered (pointed) shank end & larger taps have a center-drilled hole to use with guides. 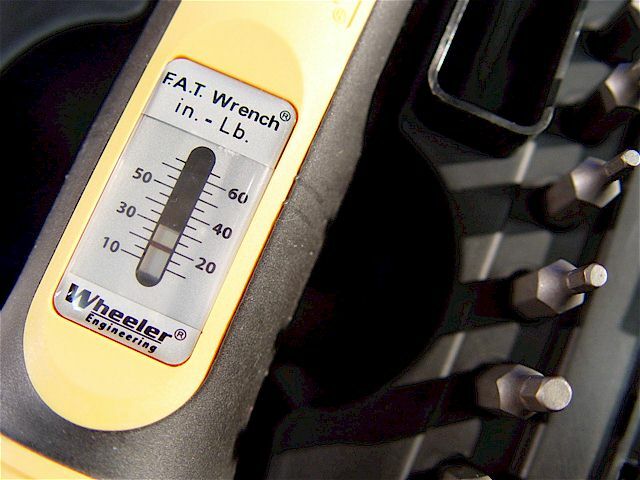 A large, chrome-plated ratchet-type (CW, lock, CCW) tap wrench with a capacity of 1/4" ~ 1/2" (M6 ~ M14). The two handles slide out for added leverage & slide in (or to one side) allowing use in tight places. This tap handle holds up to the 3/4" E hand reamer. 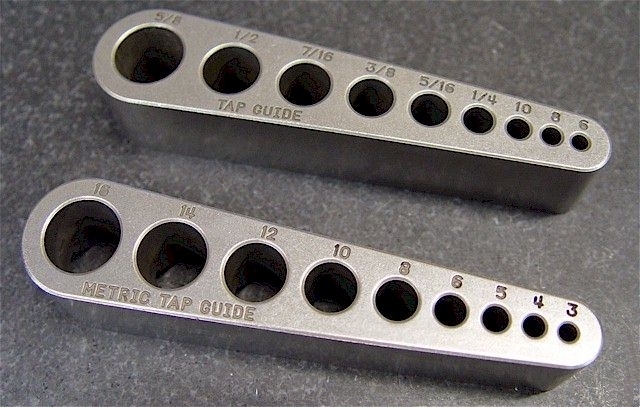 Tap handles with sturdy integral end guides (USA). 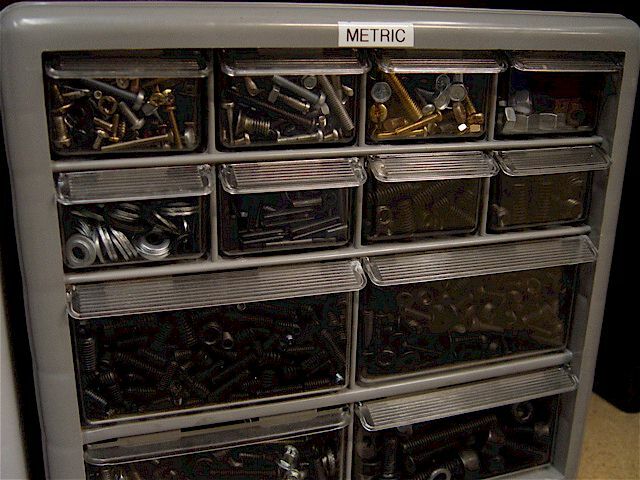 Top left to right: 1/2" to 3/4" & 1/4" to 1/2". Bottom: 0 to 1/4". 6-32 drilled & tapped (50% threads for steel) in the 9x20 lathe cross slide table back end. This particular tap handle worked nicely as it has a guide that is mounted into the drill press chuck. The large steel cross slide is 9-3/4-inches long. Everything is securely clamped & the table is locked. 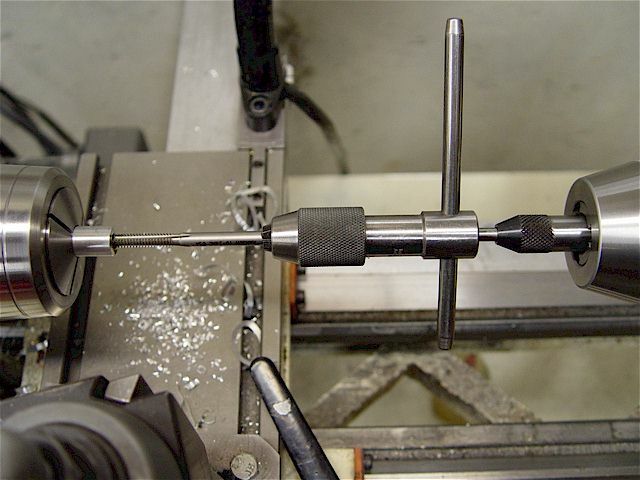 Drilling a 7/32" hole in the end of a 0.79" x 19.7" (20mm x 500mm) steel rod in preparation for a 1/4-20 thread. 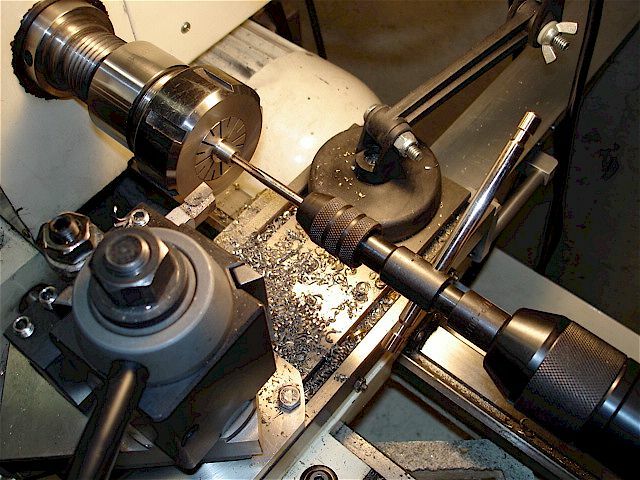 The long rod passes through the hole & hangs below the table surface of the large floor drill press. 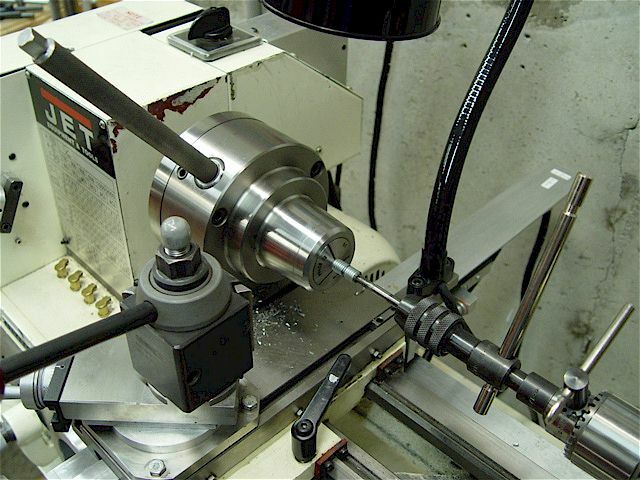 The lowest speed can usually keep the chuck from turning but sometimes I use a Tommy bar in the chuck. 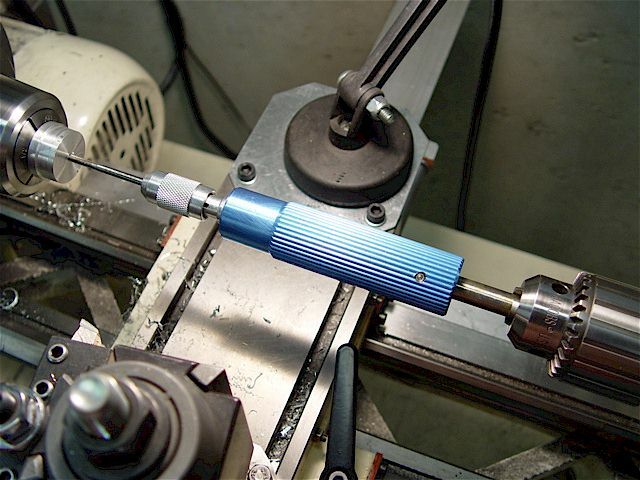 The long, precision fitted guide rod gives excellent, rigid support & tapping range. A Yankee No. 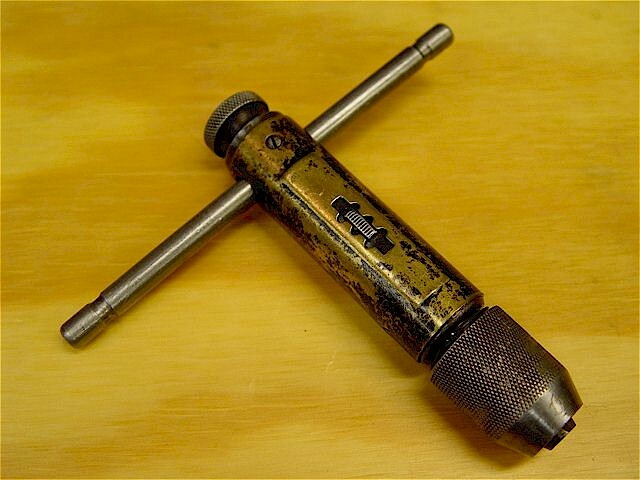 251 (North Bros Mfg., Co., Philadelphia, PA, USA) ratcheting tap wrench that has a brass body. 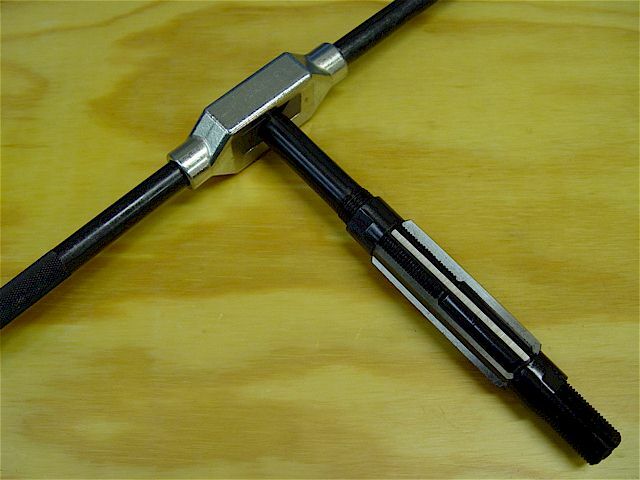 Shop fabricated steel (left) & aluminum (right) guides help start perpendicular tapping in difficult locations. 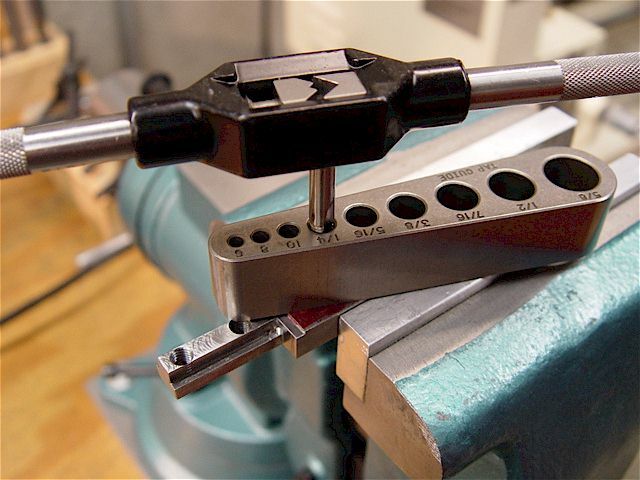 The series of holes match the US standard tap shank diameters. 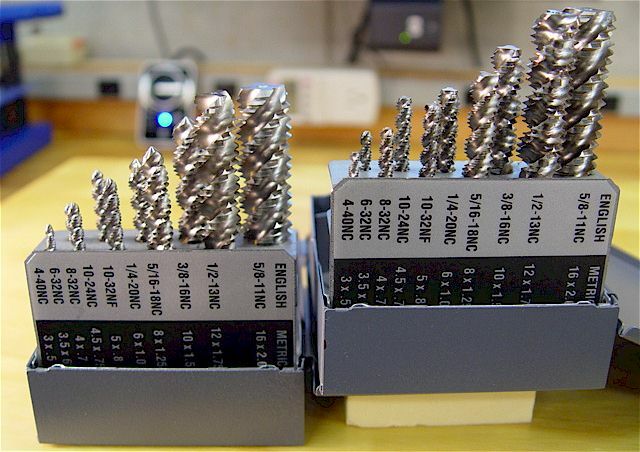 The smaller holes are for select drill bit sizes. 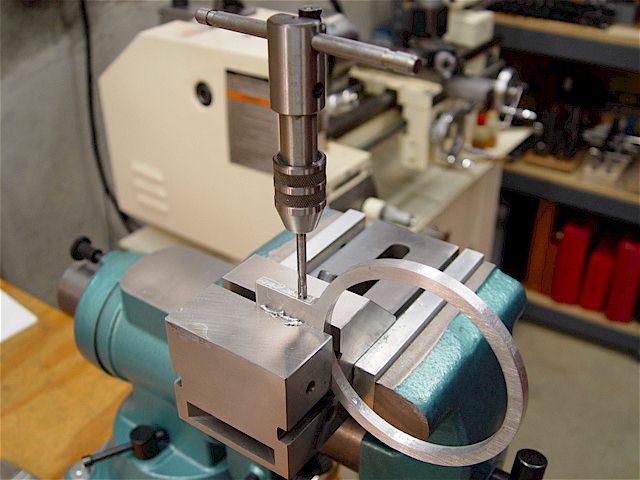 Holes are threaded with a 6-32 tap for a Taig mill DRO modification. 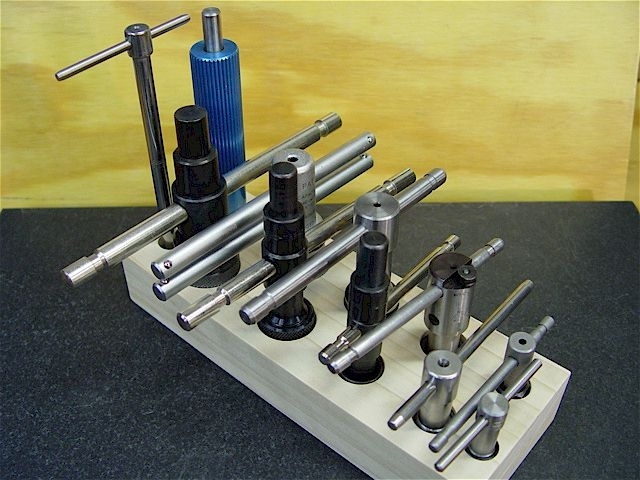 Steel tap & drill guides for both standard & metric sizes (USA). 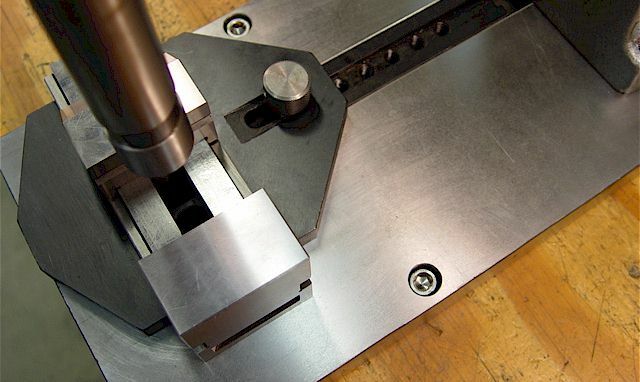 The bottom is precision ground & has a V-groove to allow accurate centering when tapping/drilling round parts. 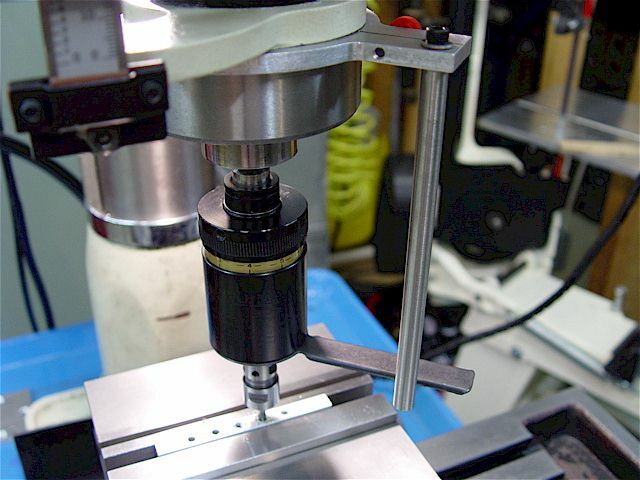 Self-aligning tap & reamer fixture (China). 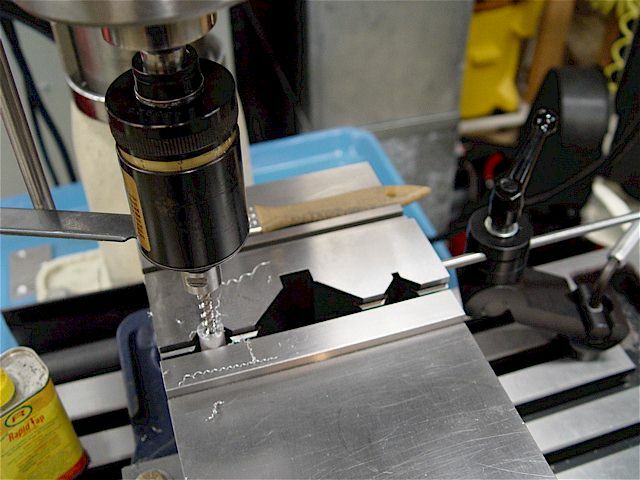 Useful for making tapped holes outside of the controlled environment of the workshop. 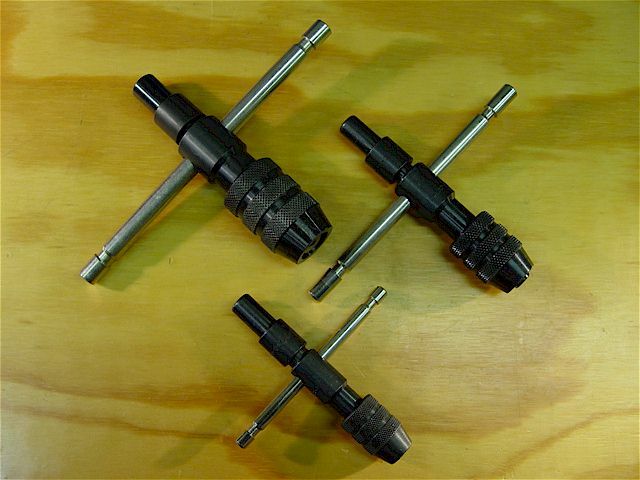 Supplied with two sets (small & large) hardened jaws to accommodate a 0-80 to 1/2-13 tap size range. The base has two, 120 deg Vees for centering on round stock. via the set screw. 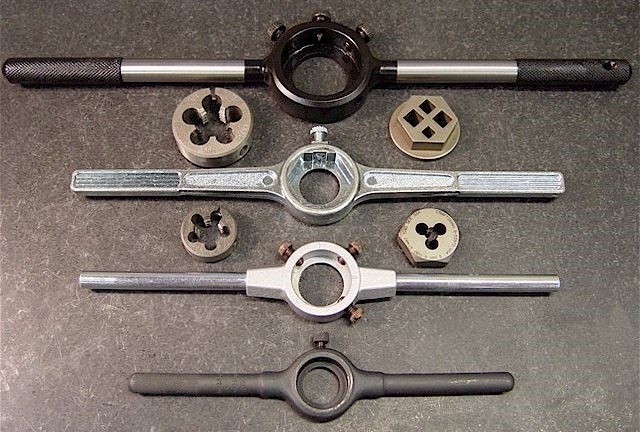 A Taig spring-loaded center is shown (bottom) that also works well as a tap-wrench pivot. 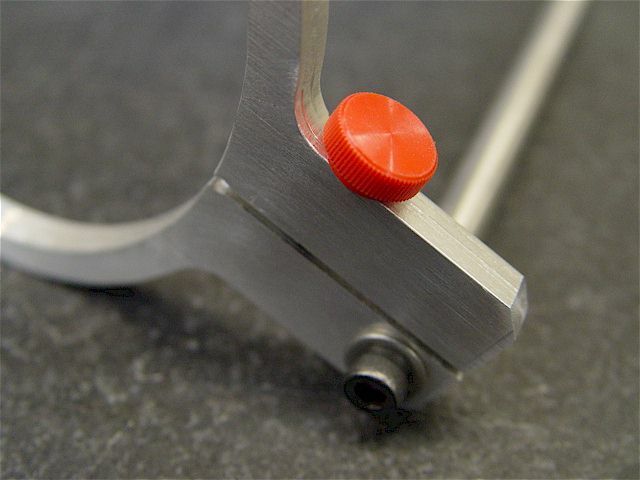 Spring-loaded guide semi-automatically adjusts out as the tap cuts deeper into the hole. 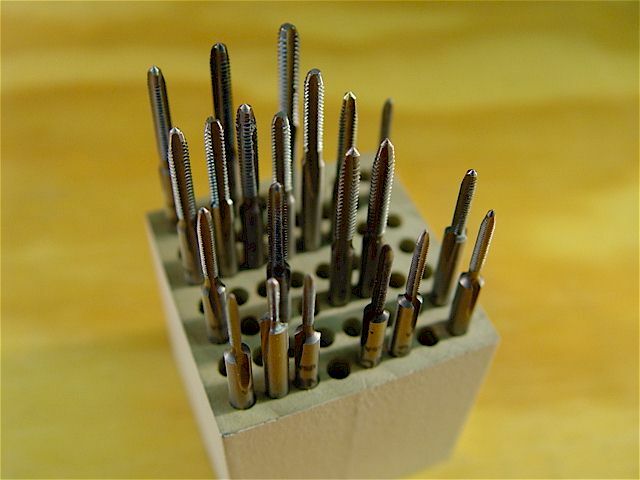 This photo shows how each tip type is used for the spring-loaded guide. Use the tap handle to hand cut the thread. 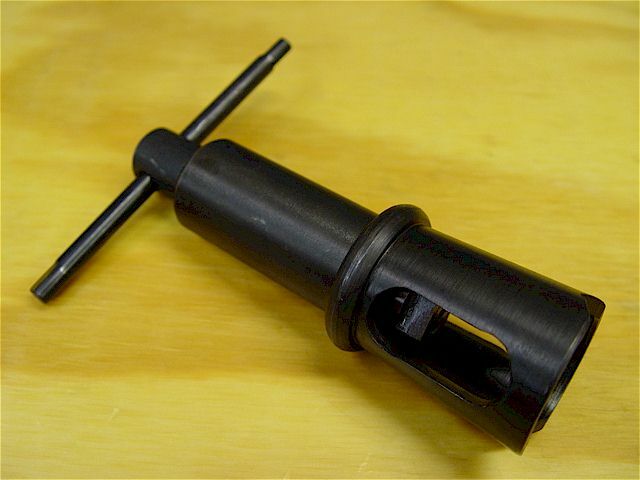 It requires a torque bar attached to either the table or the quill (bracket details are shown, below). 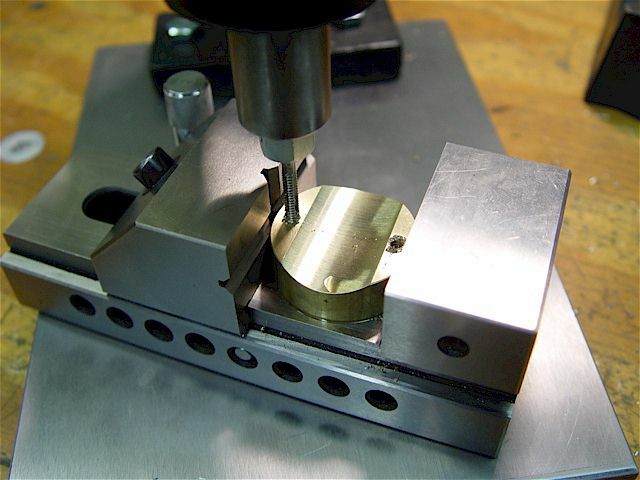 Handy device if many holes need to be tapped using a mill or drill press. Tapmatic 30X instructions. suggested tapping speeds best for high production output but I use slower mill speeds for small batches. 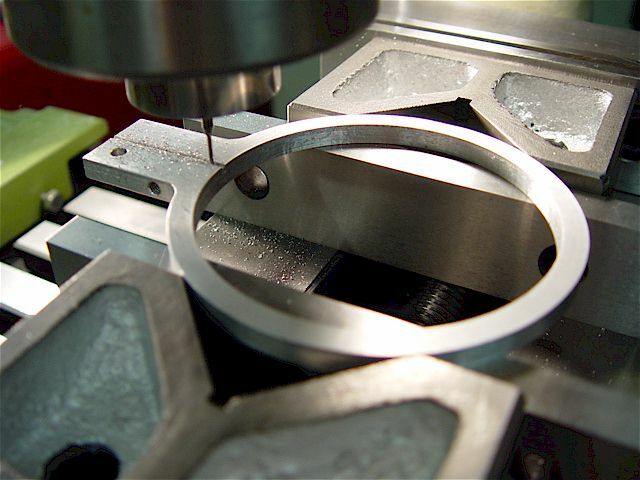 Milling a 3.6" hole on the rotary table. 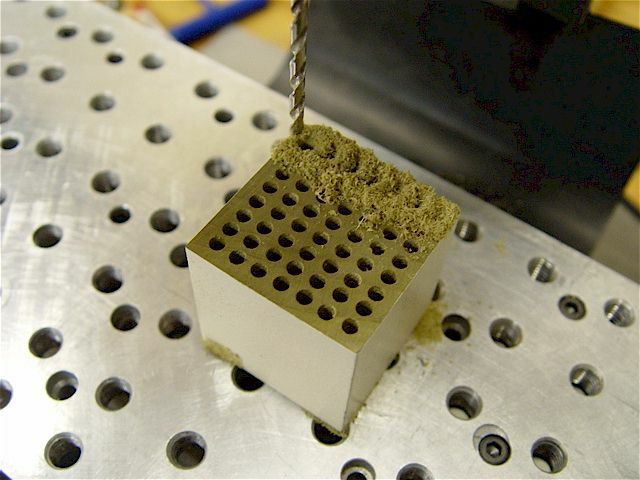 1/4" thick material was used; 1/2" would be sturdier. 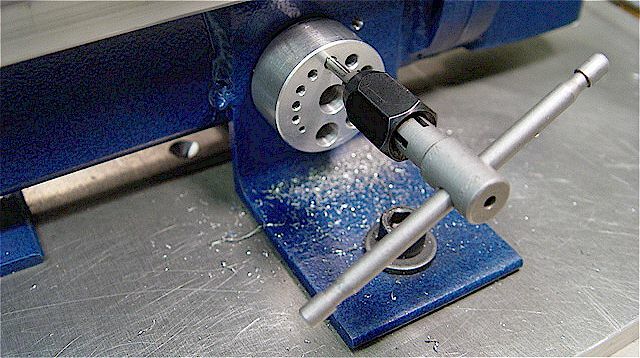 Tapping an 8-32 thread on one side of the slot followed by drilling a clearance hole on the other side. Milling a slot for the quill clamp. 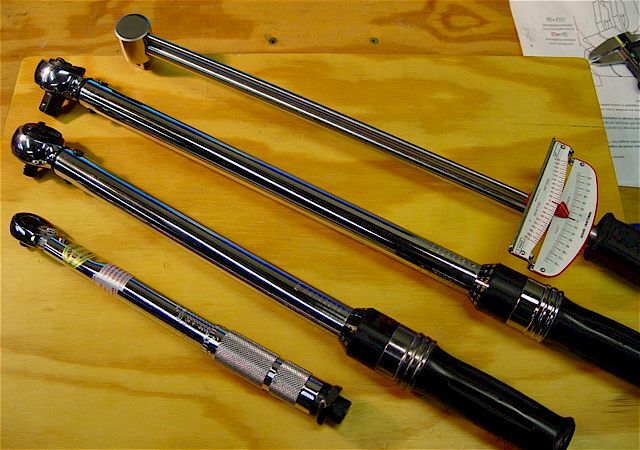 The torque bar is a 3/8" steel rod fastened by a 10-32 bolt with a washer. Under heavy use the bracket loosened so the thumb knob was replaced by a wrench-tightened cap-head. 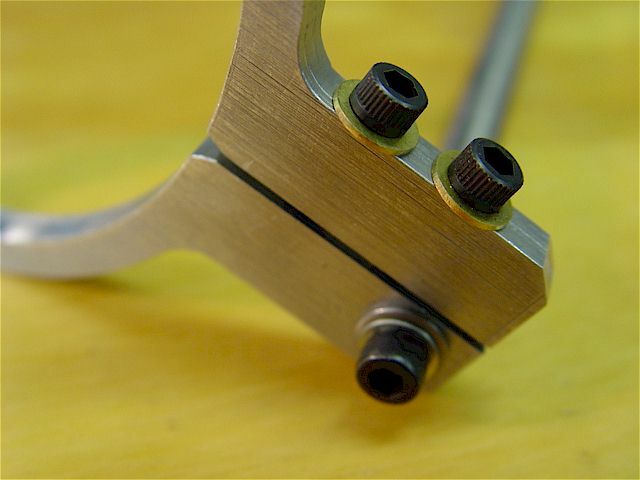 A second clamping bolt was also added to stiffen the assembly. 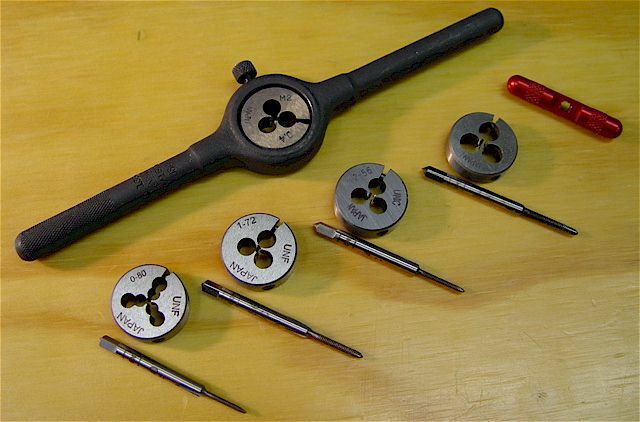 A lock washer was also added for the rod. 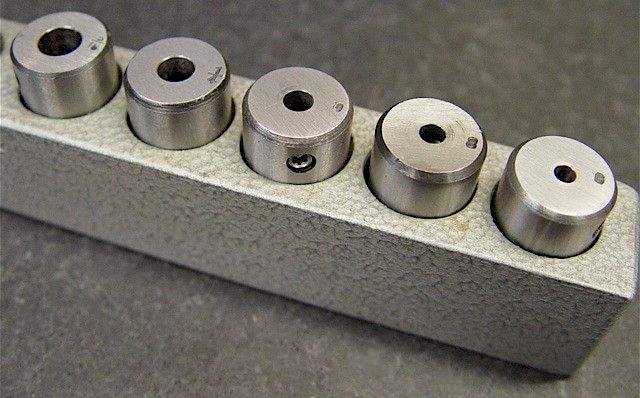 Die handles: Top one (India) is for 1-1/2" diameter dies (a split-type is shown), next one is for hex-style dies. 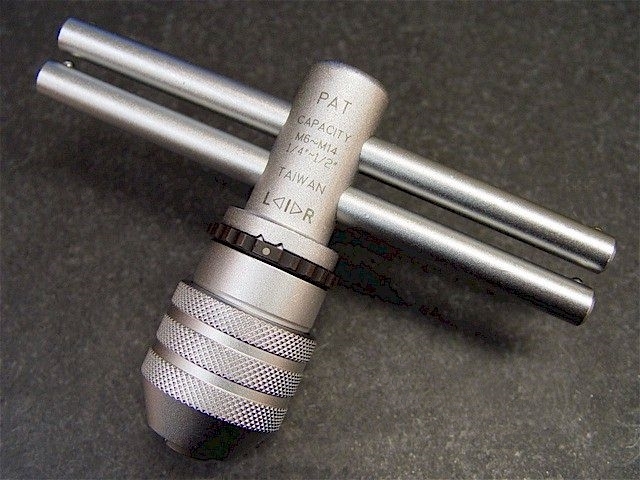 The hex die-to-tap adapter is from the metric set. 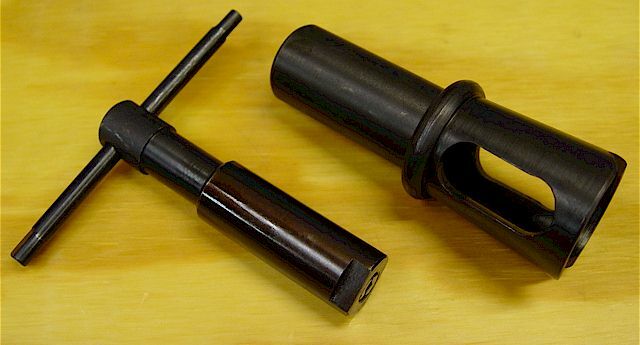 One-inch (GER) & 13/16" (USA) round-die holders shown. 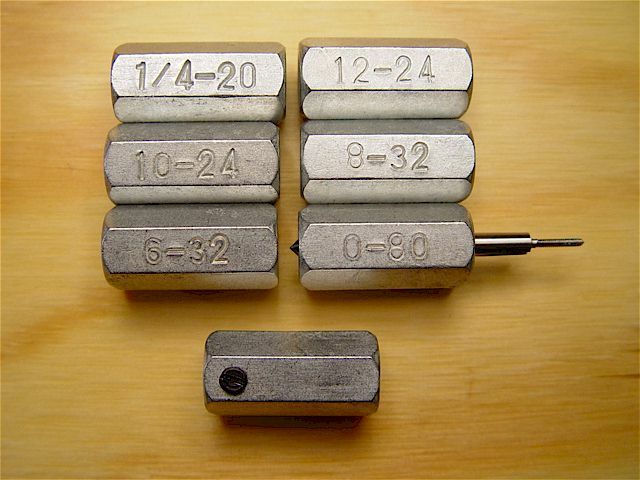 Small dies & taps (left to right): 0-80, 1-72, M2-0.4 (in 13/16" die handle) 2-56, 3-48. Small red tap handle. Wooden tap stand being made using the CNC mill. The part is held by double-sided tape. 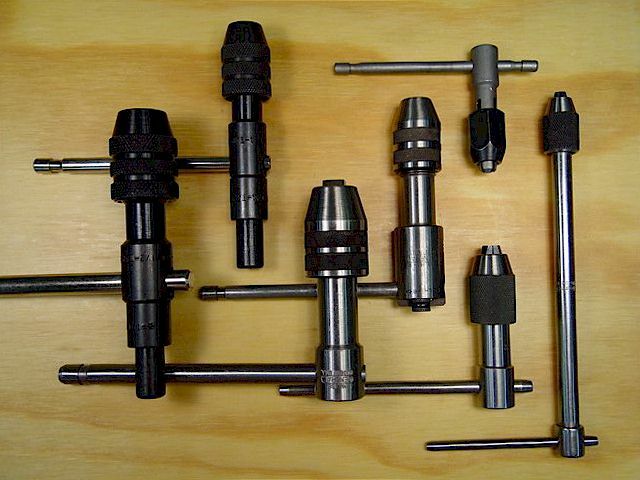 0-80, 1-64, 1-72, 2-56, 3-48, 4-36, 4-40, 4-48, 5-40, 6-32 taps. 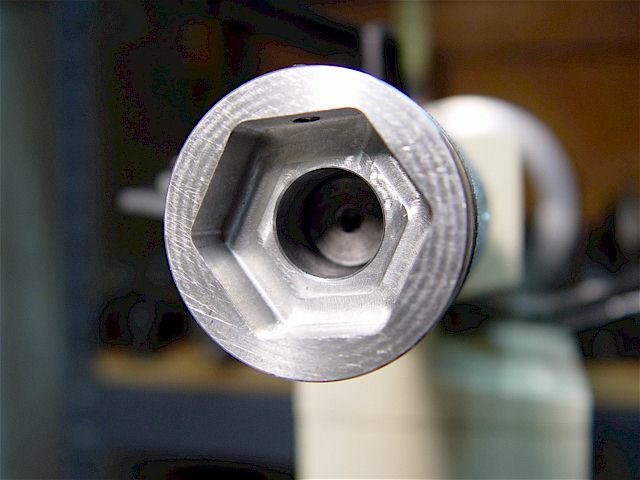 A handle that holds 20mm dies. 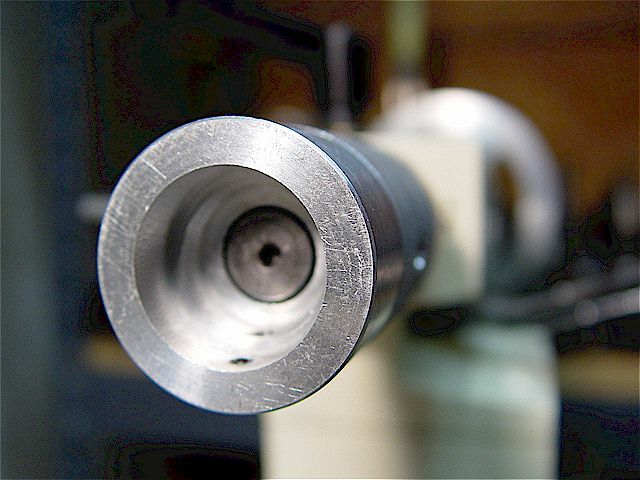 An M6-1 left-hand die is shown. 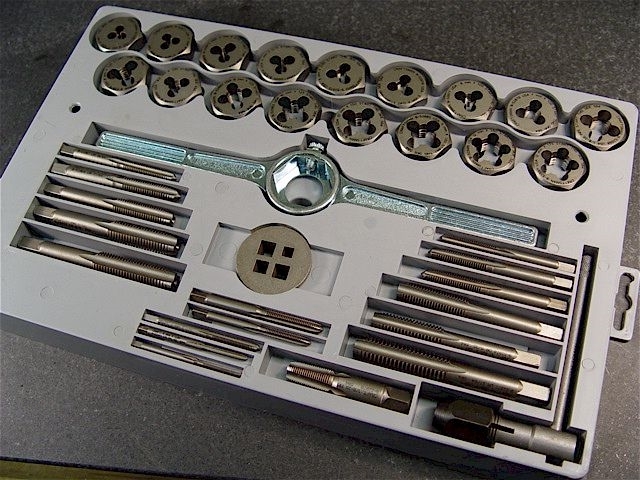 Metric die & tap set (USA). 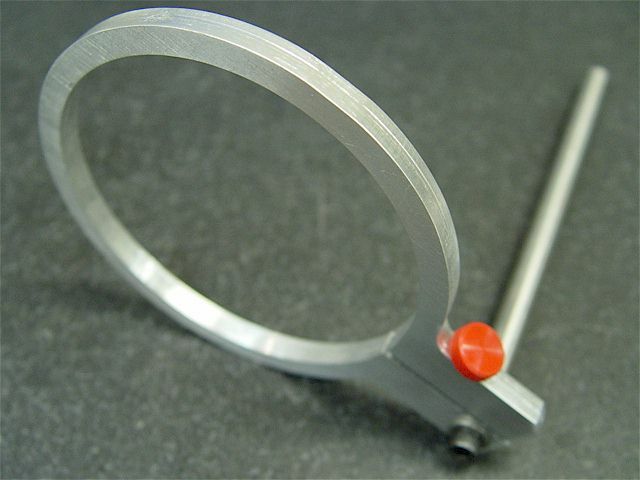 1" & 13/16" round die holder slides on a 9/16" steel rod with an MT2 adapter for the 9x20 lathe tailstock. 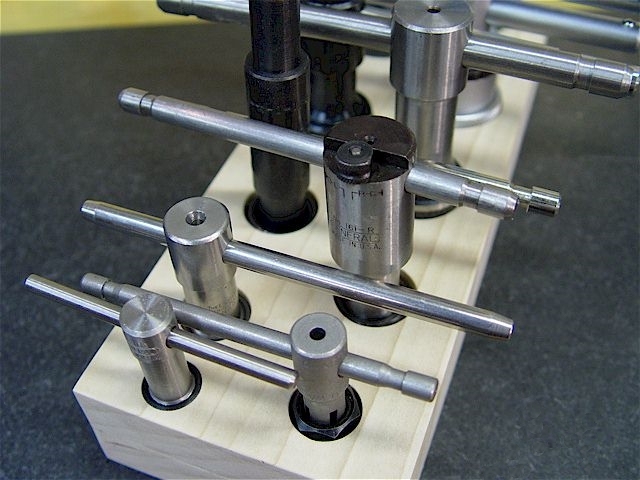 This is a hex & round (two sizes) die holder. The pockets were CNC fabricated. Left to right: examples of tapered, plug & bottoming taps. 1/2-20 size shown. 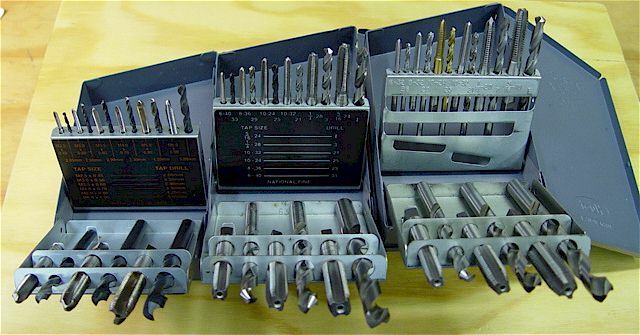 Drill & taper tap sets (18 pieces each) left to right: metric, National Fine (NF) & National Coarse (NC). Metric: M2.5-.45, M3-.5, M3.5-.6, M4-.7, M5-.8, M6-1, M8-1.25, M10-1.5, & M12-1.75. NF: 6-40, 8-36, 10-24, 10-32, 1/4-28, 5/16-24, 3/8-24, 7/16-20, & 1/2-20. NC: 6-32, 8-32, 10-24, 10-32, 1/4-20, 5/16-18, 3/8-16, 7/16-14, & 1/2-13. 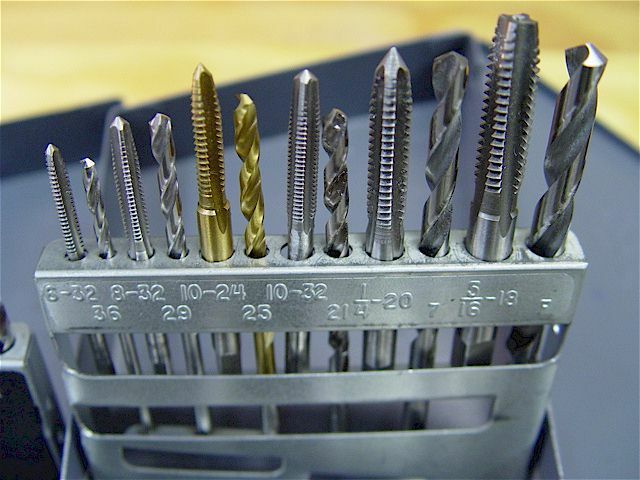 Note: the drill bit sizes are for 75% threads in aluminum, brass & plastic. 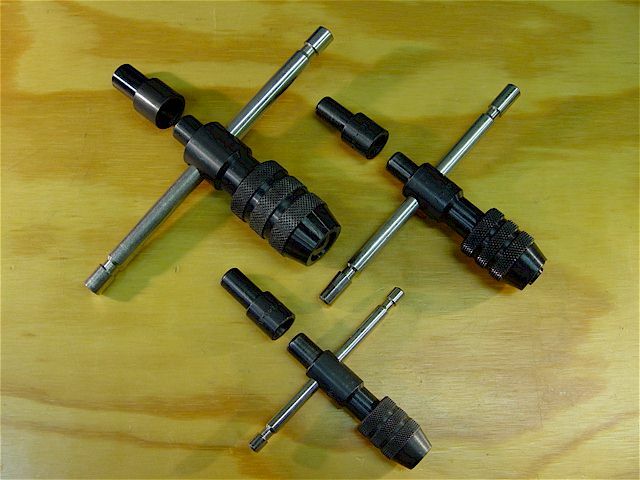 Plug & bottom tap sets (USA). The spiral flutes are effective in removing swarf, especially from blind holes. Spiral flutes effectively remove swarf. 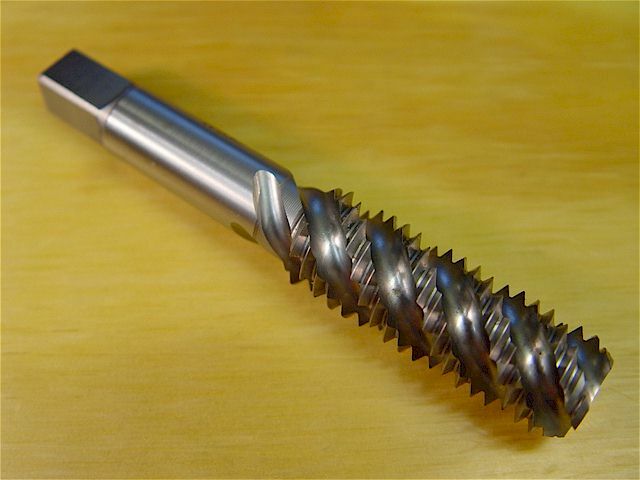 HSS combination drill bit & tap. Imperial sizes: 4-40, 6-32, 8-32, 10-32, 10-24, 1/4-28, 1/4-20, 5/16-18, 3/8-16 & 1/2-13. 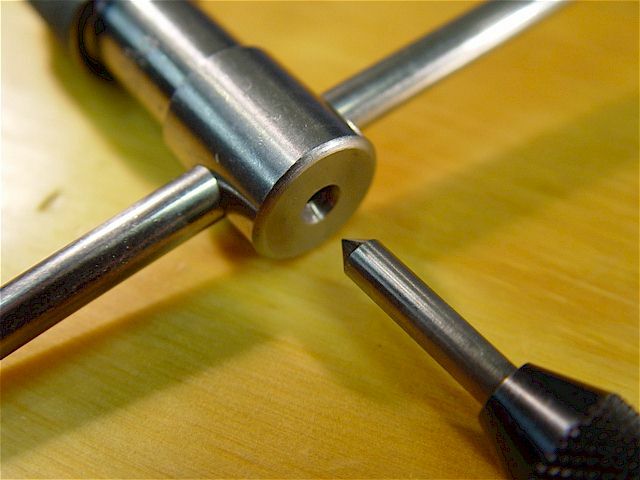 Combination drill bit, tap, & deburr/countersink. 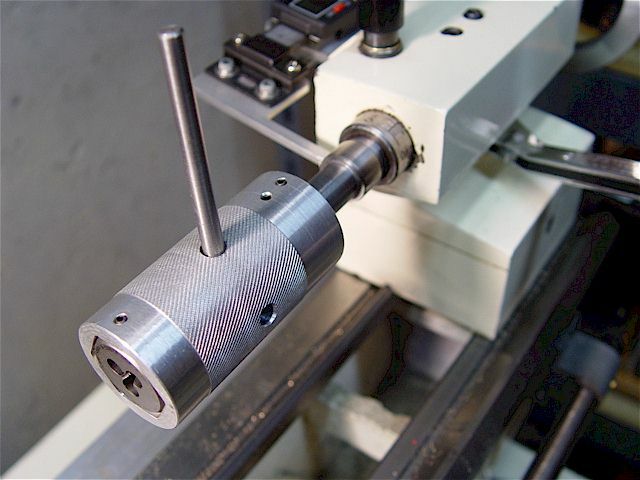 Each HSS bit has an integral deburr/countersink & quick-change hex shaft. Note the taper after the threading that prevents over drilling. Imperial sizes: 6-32, 8-32, 10-24, 10-32, 12-24 & 1/4-20. Variable quality in an import. For this 10-24, I disconnected the fine down feed & used the spring-loaded quill lever. The mill was turning at 110 RPM. Don't forget proper lubrication. 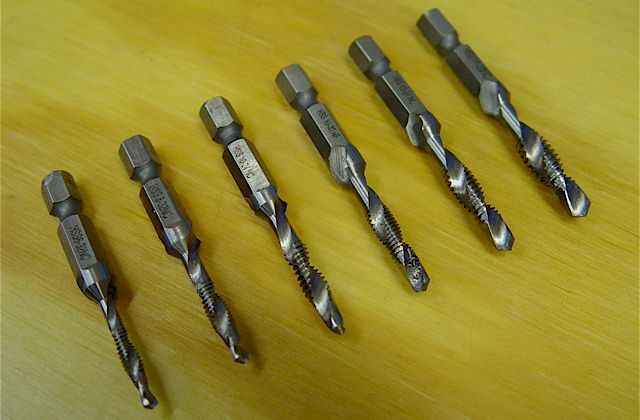 Unified Tap-drill Chart: Tap-drill bit references for imperial, metric, & pipe threads. 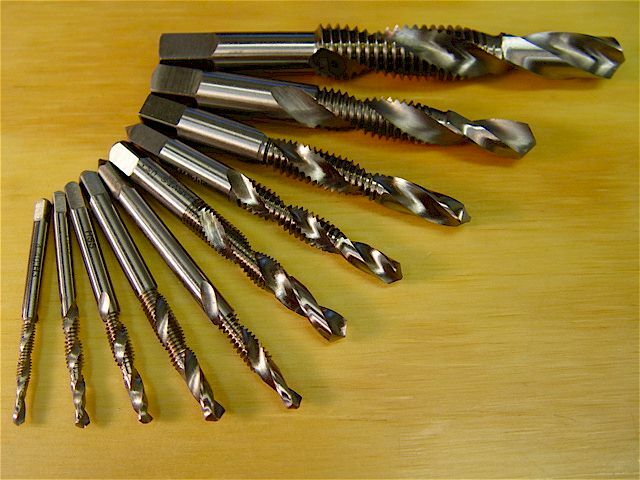 60% & 75% thread tap-drill charts. No. 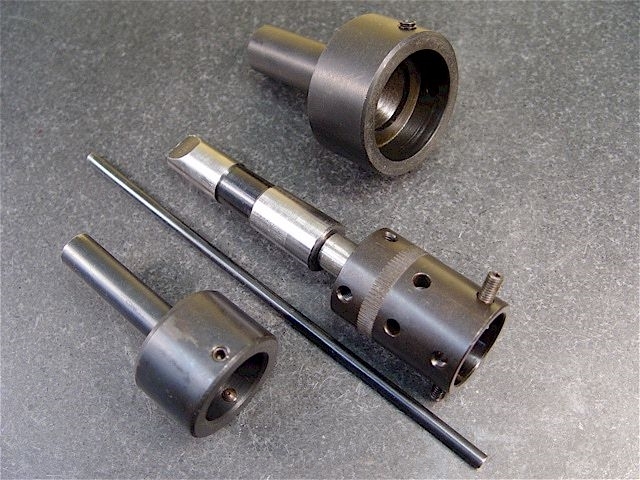 or Diameter Major Diameter Drill Size Decimal Equiv. Drill Size Decimal Equiv. Drill Size Decimal Equiv. Drill Size Decimal Equiv. 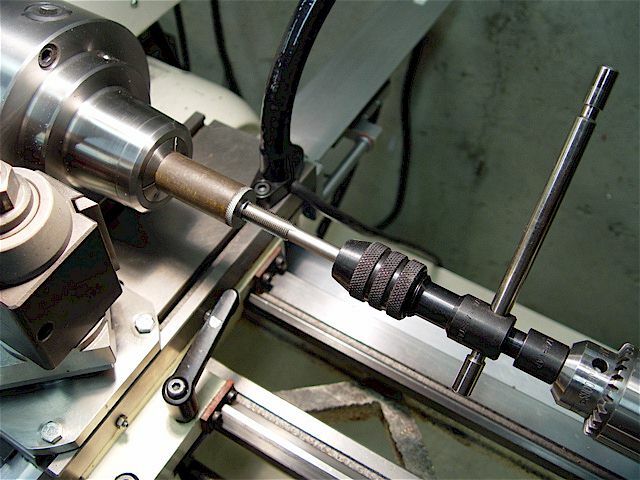 Taper pipe thread tapping requires greater accuracy & it subjects the tools to higher stresses. two wall thicknesses. 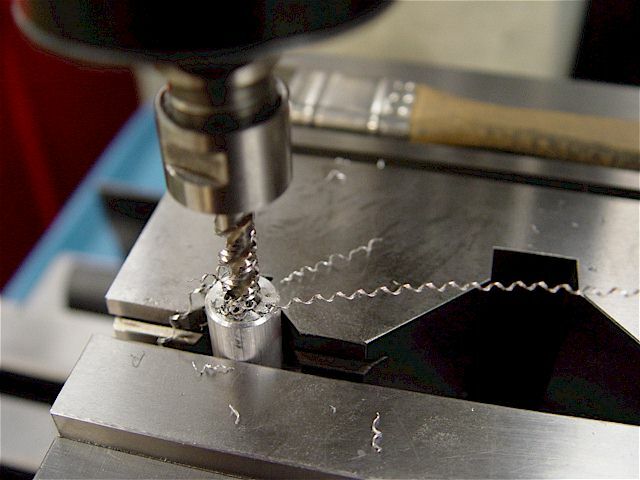 To achieve the basic thread depth, drive the tap into the work piece 12 turns. 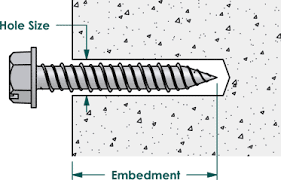 Trapezoidal (metric) screw thread has a 30 deg included angle. 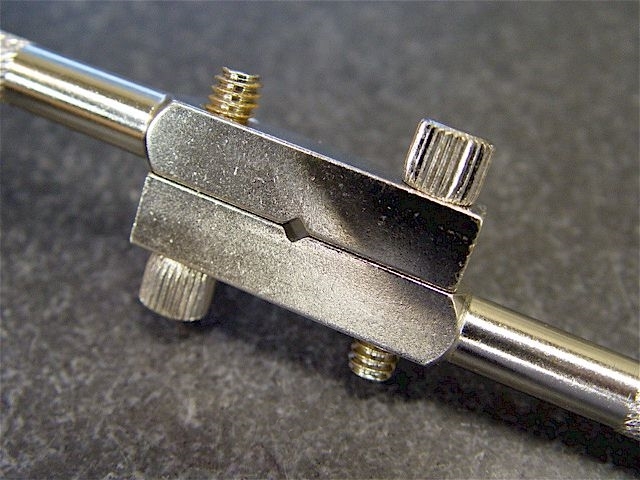 ACME screw thread has a 29 deg included angle. 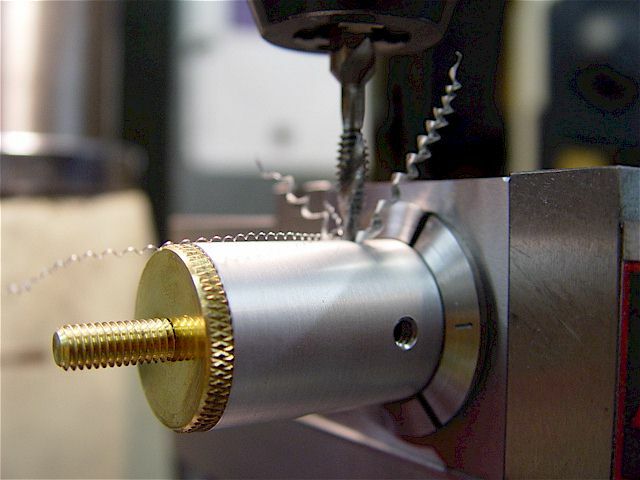 Trapezoidal screw thread is made & measured in millimeters. 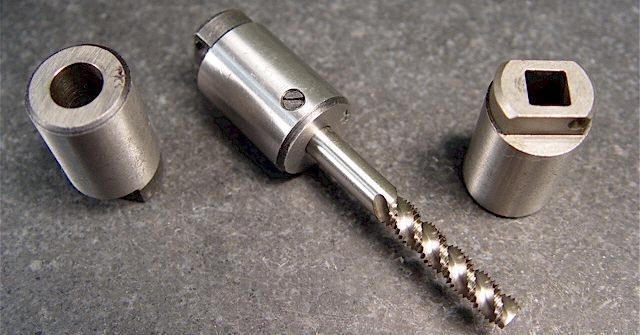 ACME screw thread is made & measured in inches. 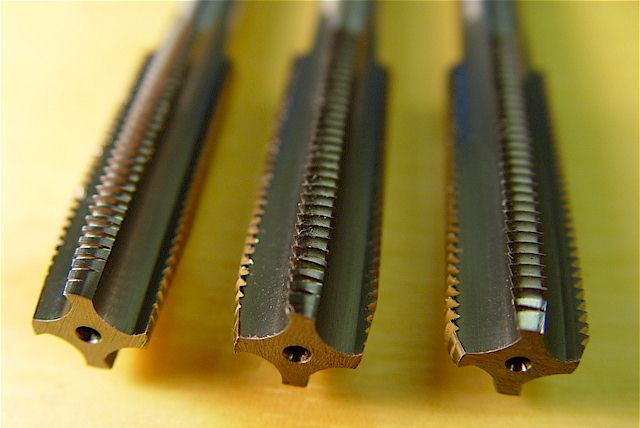 Trapezoidal screw thread pitch is stated in millimeters of pitch. 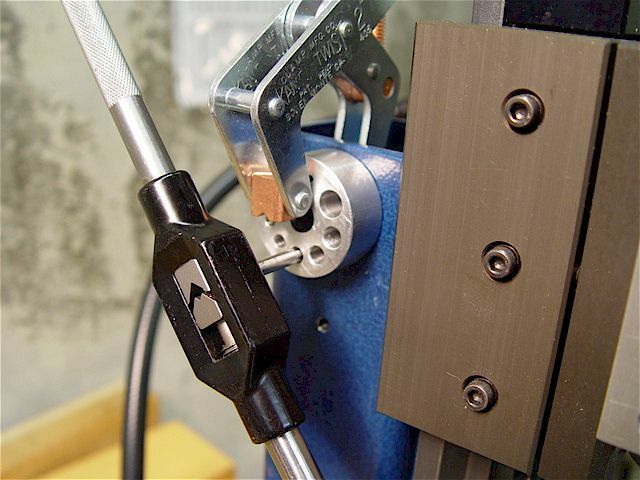 ACME screw thread pitch is stated in threads per inch. 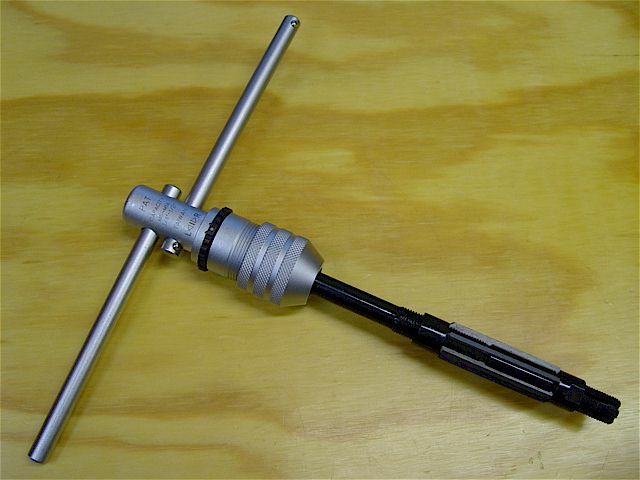 29 deg ACME (1n - 12n) & 30 deg ISO (2p - 20p) thread gages. 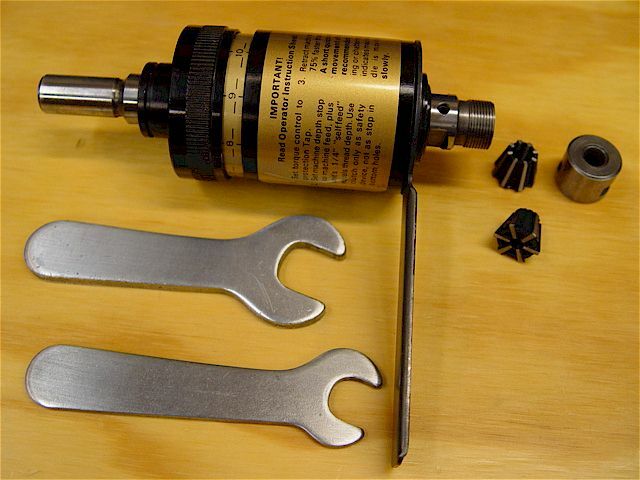 Metric (black) & Imperial (silver) nut & bolt thread checker. 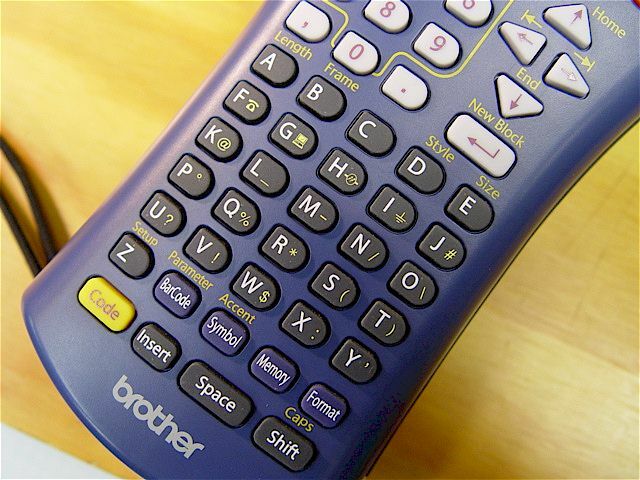 Note the lower middle set screw is verified. This is the best method as you measure multiple threads instead of just a few like the thin-plate types. 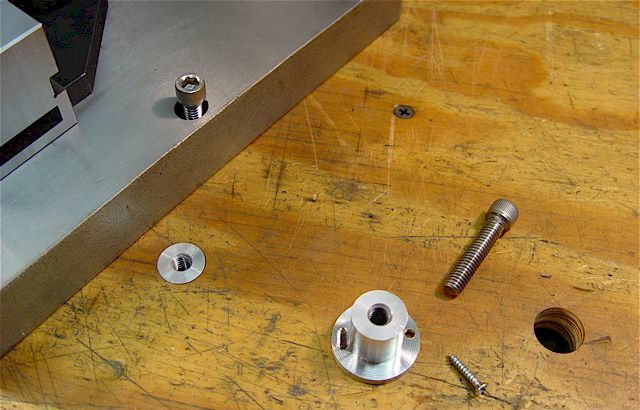 thin-plate type but the nut & bolt checker will catch the mistake as it will cross-thread as the screw goes in deeper. Refer to the Hand Tools Section, too. It takes over 440 bins to keep it all sorted. 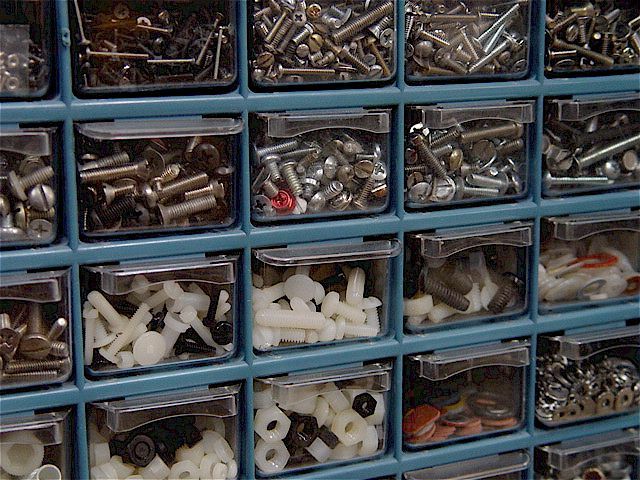 The newer polypropylene drawers are much stronger & won't crack/break like the clear ones. 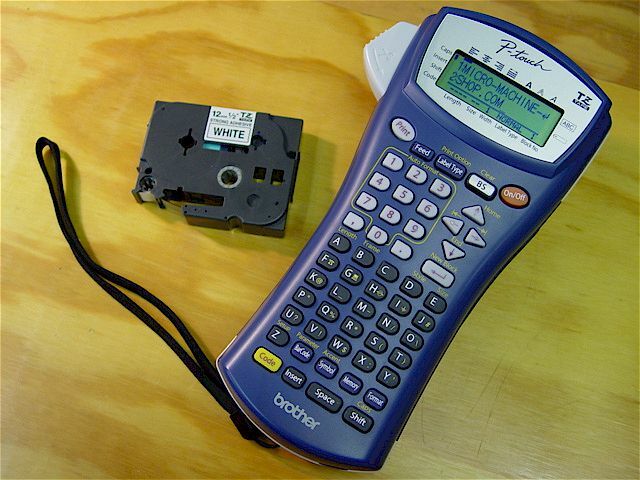 Brother P-Touch label maker (TZ Tape Type.